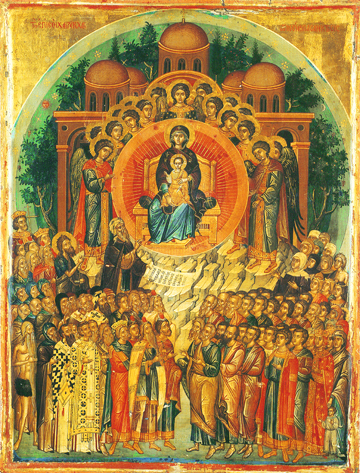 In the lower part of the icon there are rows of men and women standing, the Righteous and the Saints who have consistently honored the Virgin Mary as “more honorable than the Cherubim, and more glorious than the Seraphim” as the Hymn “It is Truly Meet and Right” declares so clearly. From the time of the Apostles until today, great honor and love is shown by the Church, and especially the Holy Ones within the Church, to the Virgin. The two larger figures, in the middle and below the Virgin, are those of St. John the Baptist, and St. John Damascene, who holds a scroll.